Now THAT is precious, Kelli! See why I call Basenjis "enchanting"?! Aww, such cute pictures and what a lovely family! Looks like you and Haley are quite the team already. Congrats, way to go! Good for you guys, and good for Liyah! Congratulations! I wonder if Consumer Reports has a review of best honeymoon locations. LOL. Dang, that was a good one Clay. Nope, this person does not ring a bell. And there are no Carols listed in Louisiana in the BCOA roster, nor anyone with that location. 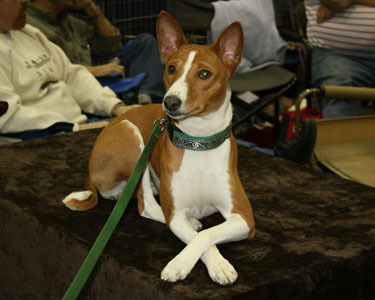 Most responsible breeders are members of the Basenji Club Of America. Congrats Michelle, that's awesome!!! I am so happy for you two, and have been wondering when I was gonna get to hear the good news. There is an ASFA trial south of Detroit the second weekend of October. I'm planning on being there if you want to come? And the sire you want to breed to should have all of these tests as well. And the same pedigree research should be done on him too. After all, the puppies will be genetically half his too, not just your girl. Make sure you think long and hard and do lots of research before getting involved in breeding. The Basenji "season" is coming up fast and maybe waiting until next year will give you more time to complete health tests, find a sire that complements your girl, and prepare your litter plans? If you are going to bring puppies into this world, you need to be responsible for them for their entire lives and ensure that you have done the best you can for the breed to produce the healthiest, happiest, well socialized dogs for their new homes. Thanks for sharing your story Carrie, it was great meeting you! Looking forward to seeing you guys again sometime. Lola and Callie look like a perfect fit. How exciting Robyn! Looking forward to hearing more about the babies.